If you don't have a Cub Scout this post probably won't apply to you. But if you do have a Cub Scout this post will save a bit of aggravation. River is now a Tiger Scout. Because he attended summer day camp he received 10 belt loops at our first Pack Awards Meeting. Woo hoo! I'm pretty sure the boy is going to need a belt to hold up his belt! 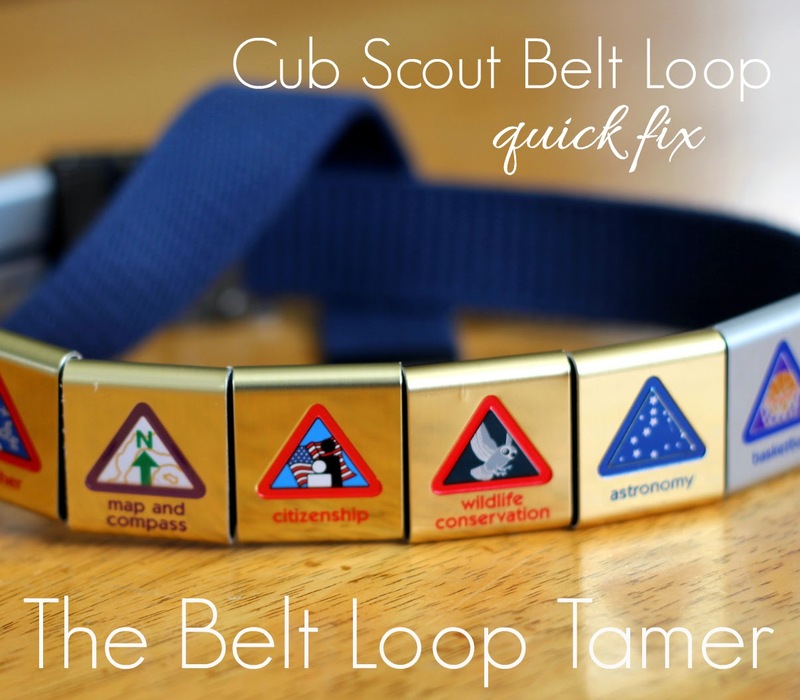 As we put his metal loops on his belt I was reminded of a simple little fix I used for Kaden's belt, our own Cub Scout Belt Loop Tamer. The belt loops slide very easily onto the scout's belt, but they also slide off very easily, which can be frustrating when taking the belt off and on. To remedy this I simply sewed a button to the backside of the belt, directly under where the most recent belt loop sits. Then I slid that last belt loop over the button. The thread won't show through on the front, so color isn't a big deal. The belt loops can still be taken off, the button just provides good tension to hold the belt loops in place. And, voila, problem solved in less than a minute using a button I already had. My Cub can now easily get his belt on and off, and there's far less worry about losing those hard-earned belt loops that he wants to show off at every den and pack meeting! Genius! Thank you!! My Bear's belt loops keep falling off but he loves wearing his belt. Thanks!!! !